X-tra base | Voco America, Inc.
x-tra base Flowable Bulk-Fill Base Composite VOCO x-tra base is a fast setting bulk-fill posterior composite that cures a 4 mm layer in 10 seconds when using the universal shade. VOCO’s x-tra base is a flowable, self-leveling base liner composite that allows increments of up to 4 mm to be placed in a single step and can be light cured in 10 seconds when using the universal shade. 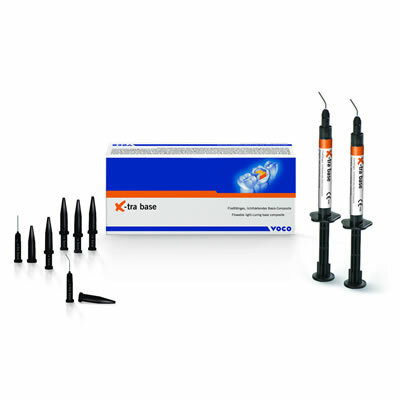 x-tra base is indicated for lining (restoration base) for class I and II cavities, as a cav- ity lining (base layer) for class I and II cavities, and can also be used for facial walls.